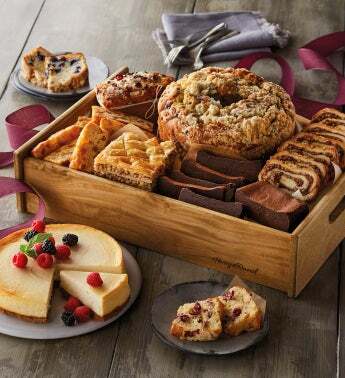 A generous assortment of baked treats is the perfect hostess gift for family gatherings or seasonal celebrations. This wooden tray brims with favorites like honey-sweet baklava, a New York-style cheesecake, cinnamon swirl, a mini chocolate decadence cake, and more. With so many scrumptious goodies to choose from, there's sure to be something for everyone.